Abarth will bring this, the Abarth 124 GT, to the 2018 Geneva Motor Show. The special edition is described as a car with two personalities, one with “unadulterated roadster thrills” and the other with a lightweight and safe technical top, the only one on the market to be entirely made of carbon fibre. The 124 GT will be in an exclusive Alpi Orientali Grey livery and those rims are 17-inch OZ Ultralight items, which are three kgs lighter than standard wheels. The mirror caps sport a special gun metal colour which matches the front spoiler, but one can choose carbon items too. Also optional is a matte black bonnet treatment. It’s a reference to the classic Abarth 124 Rally, where a black bonnet was adopted to prevent the driver from being dazzled by the sun. That can be seen clearly on the standard Abarth 124 Spider below. The removable CF hard top is lined on the inside, and has a large rear window and efficient defroster to clear it in less than three minutes. It weighs just 16 kg and contributes to improving the compactness and overall torsional rigidity of the car, while guaranteeing thermal insulation and soundproofing, Abarth says. It can be removed and refitted in a few easy steps. 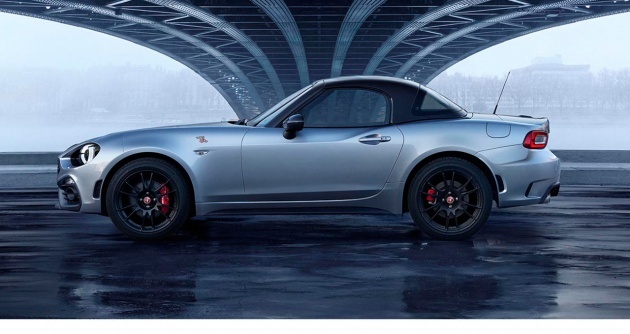 The reskinned Mazda MX-5 is powered by a 1.4 litre MultiAir turbo engine with 170 hp and 250 Nm of torque. That’s 10 horses more than the Fiat 124 Spider without the scorpion badge, and conveniently around 124 hp per litre. 0-100 km/h is done in 6.8 seconds and top speed is 232 km/h. It is available with a six-speed manual or automatic Sports Sequential Esseesse gearbox.